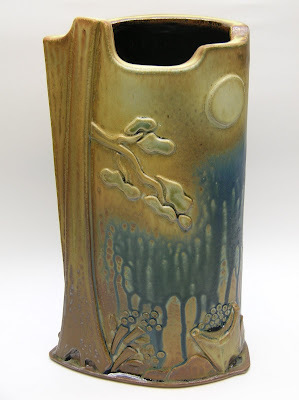 I have finally managed to transfer all my Steven Hill journey posts to my new blog which is called Centered - Focus on Clay and Creativity. For some reason a few posts would not transfer until now. I will continue to write about my work and the creative process. Thanks for following and happy potting! Years ago before I was aware of the dangers of using hot wax I used to do resist "carving" with real paraffin wax. It wasn't until I read about shellac resist a few years ago that I came back to do this type of decorating technique. The shellac dries quite quickly - in about 15 minutes. By wiping over with a wet sponge you can get relief designs in the clay as the shellac prevents the clay from being washed away. I like to paint an area with coloured slip first and then shellac, so the raised area is a different colour. 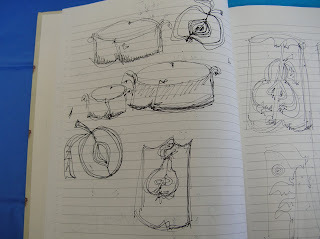 I had done some designs with pears, first trying various slips on tea bag rests and then after some sketches on some serving dishes. I use the Bringle slip with 10% black stain and cover it with Fraser Celadon with a bit of stain as well (as per Elaine Coleman's recipe) or just the clear celadon without any iron in it. 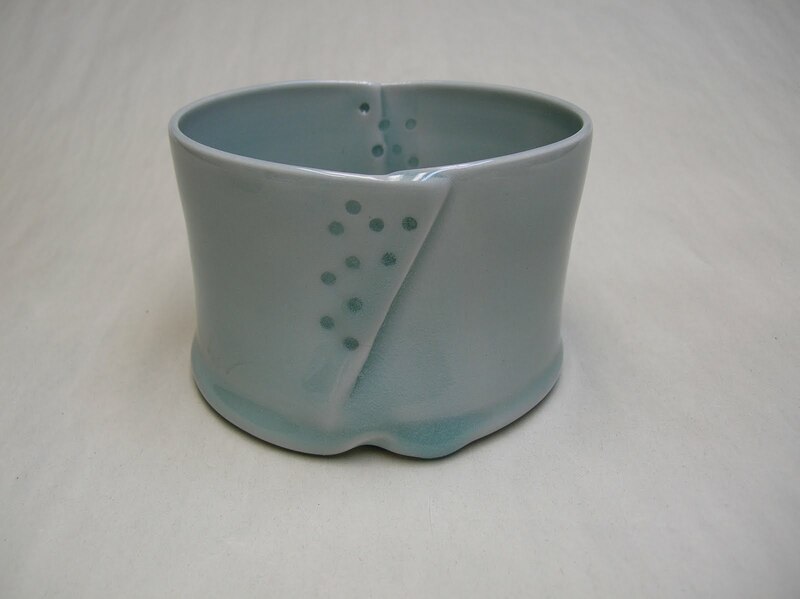 I don't get a really nice blue nor white colour as I use Harlan House porcelain and it tends to grey the colour a bit, but it is very easy to work with. It took me almost 4 months to complete this post but I hope to get back on track with writing at least several times a month. Jan/2010 - Time to get focused again on pottery after the holidays. On our way back from Florida visiting relatives we had a great visit to Ashville to see the New Morning and Blue Spiral Galleries. We also found our way into Penland as we decided to drive over Roan Mountain in North Carolina - what a spectacular place - both the mountain and Penland. Visited Cynthia Bringle there - one of my heroes and stopped by John Britt's place who is just down the road a ways. Unfortunately he was out but I could see lots of test tiles on his studio table! Did lots of sketching on the drive down - it's someting that works well for me as I just sketch whatever interests me at the moment and then for several days I work on variations. Usually I do not have time to do too much sketching at home, but this was great and helped to while away the time on the interstates. On the way back I usually had to drive as my husband found my navigating on the back roads to be rather unreliable. 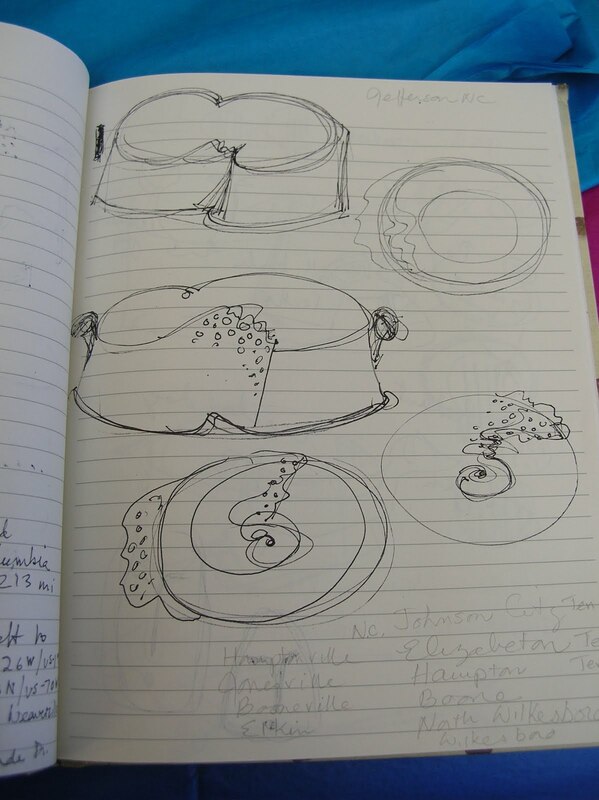 The sketches for the small oval serving dishes had lots of movement in them but once back home I was had a hard time trasferring that into reality. 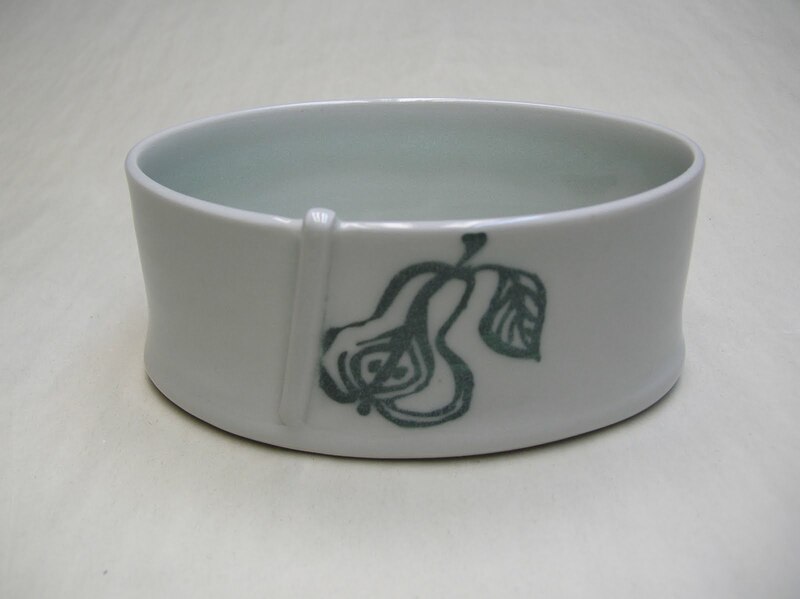 The dishes are made of porcelain, thrown, altered and a flat base put on. 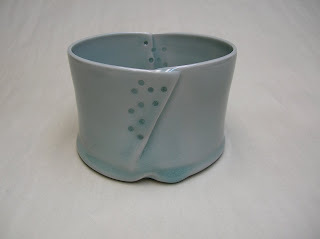 I pierced the overlaps and hoped that the celadon glaze would cover the holes and let light through which it did. Will need to work more on these as I rather like them, but as you can see in the close up the inside of the hole arrangement is rather messy. Part of my journey contract was also that I would write a weekly blog about my journey. I really didn't quite keep up the weekly bit, but I really did amaze myself that I did manage to write over 55 blogs - this is the 56th in 18 months or so. In fact writing the blog has been really valuable for me - it helps me to focus on my work. 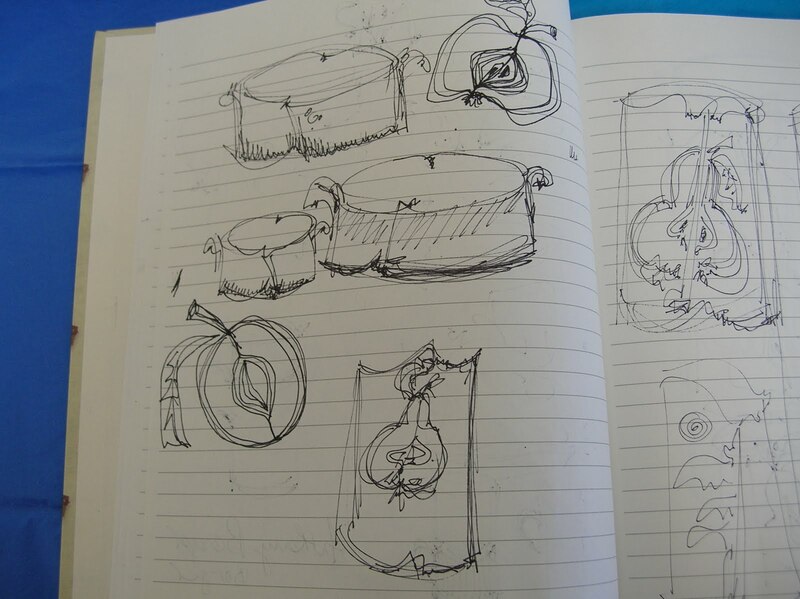 By reading back from time to time I can see various stages in my progress. Another thing that it has done for me is to get me to take photographs of my pots - a really valuable record. As I look back over the old postings I can see various stages of my work - some good and some bad, but at least I can review them and learn from them. So back to the Journey celebration weekend - unfortunately I did not take very many pictures - was too busy having fun! Saturday morning we were treated to a short workshop on photographing pots. I must say this was the best talk on this subject that I have ever heard. Steven explained his setup to us, explaining where he got his equipment and how he used it. Not being a professional photographer himself, there was thankfully not a single mention of f-stops, etc - all the stuff that I can never understand no matter how hard I try. He also took some pictures of our pots with his setup and in the evening we saw them on the computer - what a difference a great photograph can do to make a pot look great! I came home eager to get a something similar. Steven should really offer photography workshops as well - they would be well worth it. In the afternoon the gallery was open and since Rob, Lindsay and Sarah lived in the area or had relatives living close by, there was a great turnout! 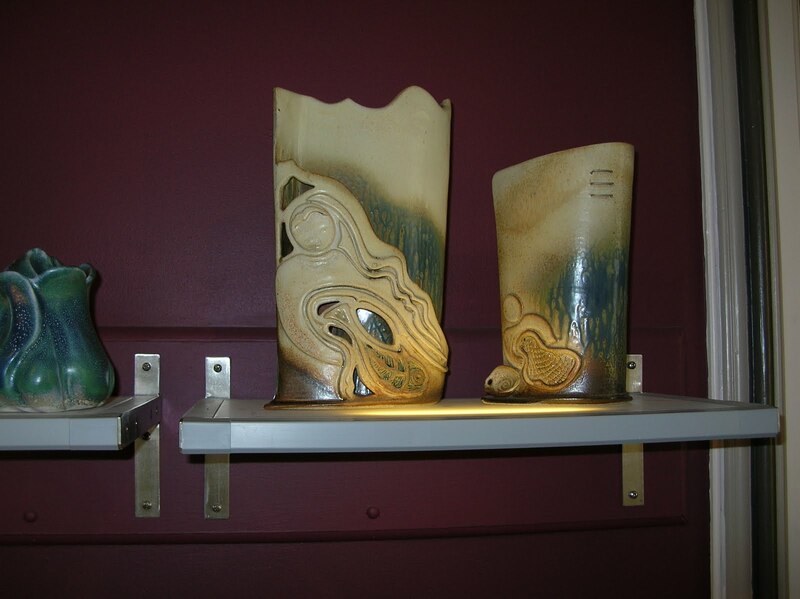 I really liked the lighted shelves that Steven had in his gallery - they really did a great job displaying the pots - as seen in this photo of my two fishing lady/boat pots. Over a pizza supper we celebrated our accomplishments. Two art teachers/potters stayed for supper and it was very interesting to talk with them as they were involved with the Potters for Peace project - making water filters in Third World countries - something that has always interested me. Sunday came way to fast - and it was time to say goodbye after a fabulous breakfast! Thank you Steven for a great journey! And thank you all, including Kim and Richard for making this such a great weekend! I hope that we can continue to follow each others' work and see how we develop. This will be the last post under the Steven Hill Journey Workshop July 2008-09. However I am not giving up my blogging. 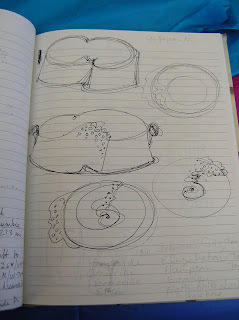 I think I will continue this blog under a new name - Centered - Reflections on From and design or something like that - as I think writing down my thoughts about my pots will be a big help to me, even more so now that I do not have a monthly critique deadline. However Steven offered us a chance to continue with the journey - either with another journey ending in a gathering in Oct 2010 or with just monthly consultations. Although I would love to go back next Oct, the airfare from Canada makes it rather expensive for me, so I will save that airfare for sometime in the future for another of Steven's workshops like the pouring vessel's and cups one. However I am opting for the monthly consults which I hope to start after Xmas. I think that Steven will be able to help me define new goals for myself and those monthly critiques will keep me focused on those goals. Well I got all the pots packed - the 4 plates were stacked and packed into a cloth bag for carry-on. It should fit under the seat, though I hope not to have too much walking as the pots are really heavy. I dread the Chicago airport - coming from Ottawa I am not used to these huge airports with miles of terminals. After a delay due to bad weather at the Chicago end my plane arrived 2 hours late. Fortunately my fellow journey women, Ann and Marion had not given up on me and I was able to share the rental car with them to Center Street Clay. It was a great to be back - some changes though with Kenyon replaced by the new resident Richard who has hair just like my son and in fact in profile looks just like him. It was amazing! Steven got us all to work, unpacking our pots and getting them into the studio. Looking at his agenda sheet we saw we were in for a busy weekend! It was great to see Lindsay and Sarah again and to see all the progress that everyone had made in a year. Ann and Rob had been in the Oct 08 workshop so this was the first time that I had a chance to meet them and see their work. After a great chili supper with corn salsa we talked about our pots. We had to number and price our pots and with a list take them up to the gallery. I priced my big wall plate higher than the appliqued vases even though in terms of work, vases take way more time. But plates sell at a higher price - as they are considered wall art and so people will pay more for them. Friday morning we all got together in the studio to talk about our individual journeys while Kim set up the gallery with our pots. It was interesting to hear what everybody else had gotten out of their year long experience. I think we all felt that this had been a very worthwhile experience and it had definitely changed our work for the better. Steven remarked to me that he had looked at the pictures of my pots when I had applied and what a difference a year had made! In the afternoon we gathered in the gallery for critiques. Here is my corner with some of my pots. I think that I reached part of my journey goals and that was to develop a more unified look, concentrating of form and design. 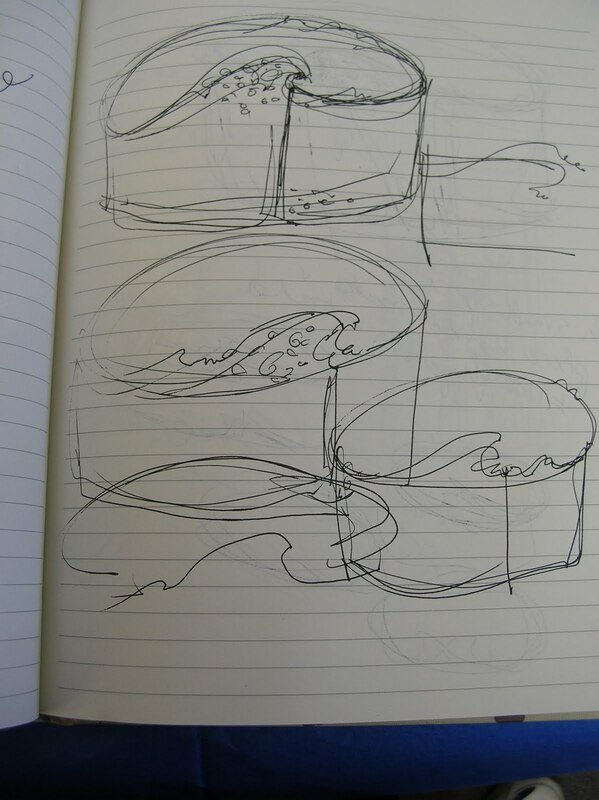 However the other part to develop an appropriate palette for the forms - I think I still have a long ways to go. I still need to improve my spraying - I need more control when changing colours and perhaps an airbrush would help. Also it always seemed to me that there was something not quite right with my fish plates and Steven felt that the fish looked like dead fish on sand - so I will try a blue version of the stony yellow on the fish area. The stony blue should be a more subdued blue than the blue ash. I found that whenever I tried to use the blue ash the rivulets competed too much with the fish stamp and the design was lost. As well when the stamped design is done in a darker colour you also seem to lose it. An impression done in a lighter colour makes it stand out, especially when you have some contrasting color in the impression. That evening we went to the national juried Clay3 (clay cubed) exhibition. Sarah, one of the journey participants had two of her pieces in the show. All pieces were exhibited in 1 foot plexiglass cubes and made for a very effective display. No iron speckled pots (my favorite! )in that show! 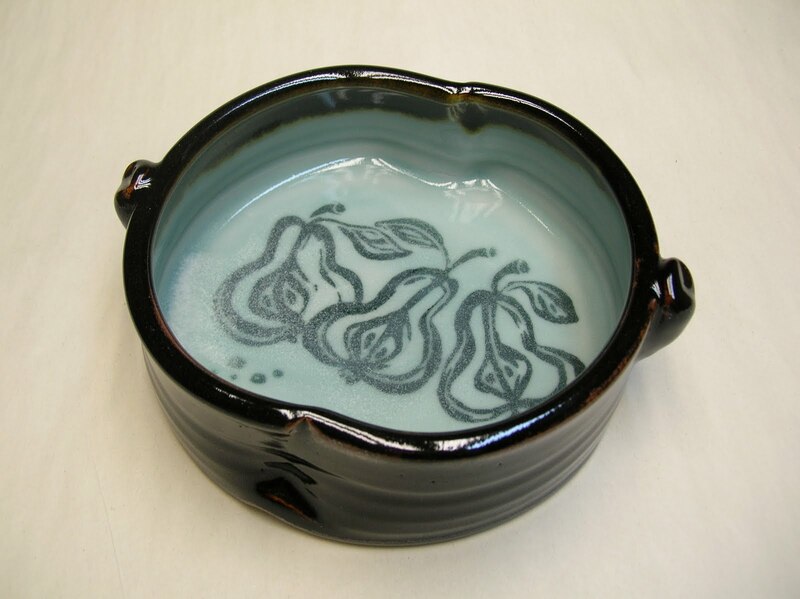 My favorite was "Overlapped Bowl on Pedestal" - handbuilt and soda fired by Marcia Tami Paul. Some really great pieces and lots of new ideas. I liked the little cricket cages as something new. There was also a great talk by Mary Kay Botkins, who was the juror. Journey Oct 11 to 18th Time to pack! 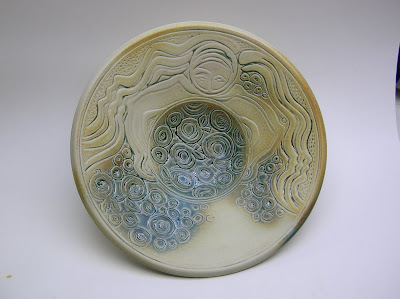 This week was the last firing for my journey and the kiln opening was on Wednesday. I thought that I finally had a winner in the fishing lady pot - the appliques were simplified (no applique where I will have runny blue ash! 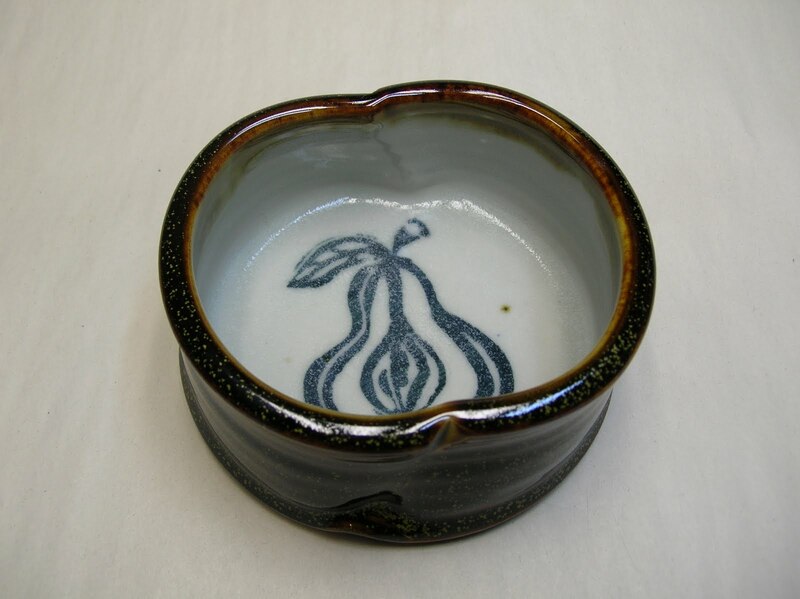 ), the glaze all the right thickness and in the right spots. However a few hours after unloading I examined the pot more closely and saw that there was shivering on the rim! The replacement blueberry pot which did not have good glazing again - however had no shivering. What had happened I think was that I had sprayed white and blue slips on the greenware pot to brighten the colours a bit on the stoneware clay. However once bisqued, I realized that I had too much blue (I had been tying to tone down the blue - so what was I thinking spraying on blue slip? )and so resprayed again with a thin layer of the white slip. 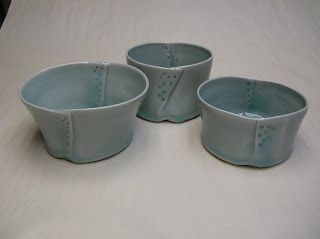 I had used the slips on bisque ware before with no problem, but I think the second time the slip did not stick as well to the bisqued slip layer and so there was some shivering on the rim. However I had used Tuckers Smoothstone which has a lower expansion than their other clays so that could have had an effect. The blueberry picker which had the same treatment with slips still has not shivered -and it was out of Smoothstone as well. So not sure what is going one. As I was in a rush to get this pot finished I did not applique on a person - just the blueberry bucket. I think maybe it leaves more to the imagination this way- still have the spilled blueberries and shoe on the back. 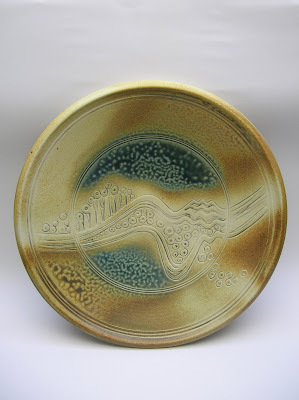 The landscape plate - I finally got some of the Hannah Ochre ash to run - this complements the runny blue ash . The problem has been that if there is any Stony Yellow present under the Hannah Ochre it stops the rivulets from forming. When I spray I try to get intermingling around the different glazes and so the Stony Yellow tends gets under it. This plate was the one that turned out the best - unfortunately it had cracked on the foot. I spent yesterday trying to figure out how I will pack the pots - I will carry on the plates, put one of the fishing lady vases into a computer bag. Then I found a hard sided suitcase that was being thrown out by the second hand store next to our Potters Guild and it will hold 2 largish cardboard boxes. My soft sided suitcase will hold another two cardboard boxes. By surrounding the boxes with bubble wrap and clothes I should end up with the double box effect necessary for safe transport. I do have a direct flight to Chicago so that should minimize baggage handling. Journey Sept 28 - Oct 10th One last firing left! Well journey's end looms on the horizon. Looking at my stash of pots that I have I ready I find that I do not have any that I am really satisfied with to take to the final get together at Center Street Clay. 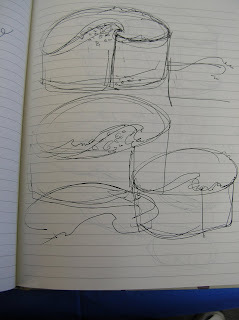 If the glazing is good then the pot has a crack and if there is not crack then the glazing is bad. The few that I am satisfied somewhat with are the plates. Unfortunately all the large plates - 14" and up with the woman/fish ended up terribly glazed and it was only the small 10" one that only turned out OK. In the last week I speed built replacements for the fishwoman and blueberry picker - building and speed drying the slabs pots in three days. They bisqued OK without any cracks except for a small one on the rim of the blueberry picker which I tried to mend by rubbing in a patch of sodium silicate with bisque dust. I also added an extra layer of glaze to see if that would also cover the slight crack. The kiln opens tomorrow morning and we'll see. I need about 10 pots I guess - about 3 or 4 major ones with some smaller ones. 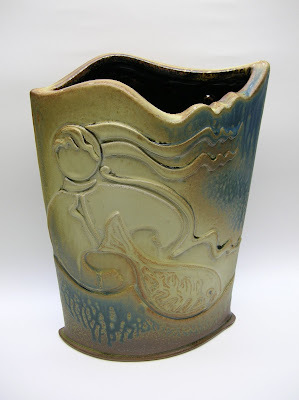 Pots that show a unified look - as that was what I was looking for in this journey.